Notes: Signed by the Duke of Wellington - President of the Rare Breeds Survival Trust. The above Royal Mail British Cattle stamps were issued on 06 March 1984 by Royal Mail and feature the following stamp designs: 16p Highland Cow; 20 1/2p Chillingham Wild Bull; 26p Hereford Bull; 28p Welsh Black; 31p Irish Moiled Cow. 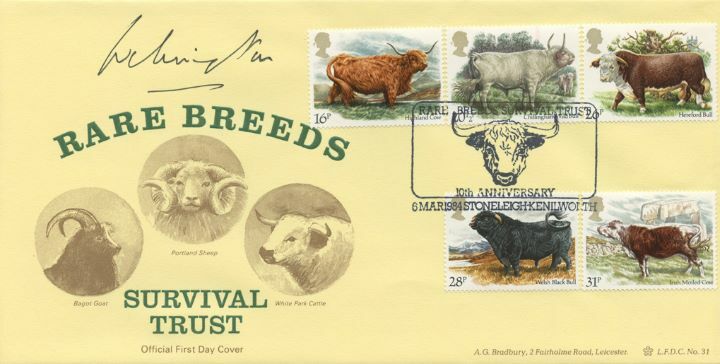 The Rare Breeds Survival Trust first day cover with the Stoneleigh, Highland Cow, Special Handstamp postmark has been produced by Bradbury and features these stamps which can make a very collectible and lovely gift.